Starting with a chocolate recipe in the New Year I realize, does not make me popular. I know that some of you have New Year’s resolutions to lose a bit of weight. But what can I say? These Totally Chocolate - Chocolate Chip Cookies won me over! 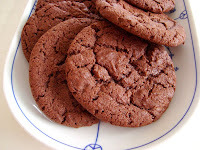 Because Nigella’s Christmas Chocolate Cookies were such a huge success, I wanted to try another chocolate cookie recipe. This recipe is adapted from Elinor Klivans’ book ‘Big Fat Cookies’ – and that they are! You only make 12 cookies out of this dough so they are HUGE. Very chocolate-y, very quickly gone! Rating 4+ out of 5. - Preheat the oven to 325°F. - Break the 4oz chocolate into pieces and place into a heatproof bowl set over a pan of barely simmering water. Heat, stirring occasionally, until melted. 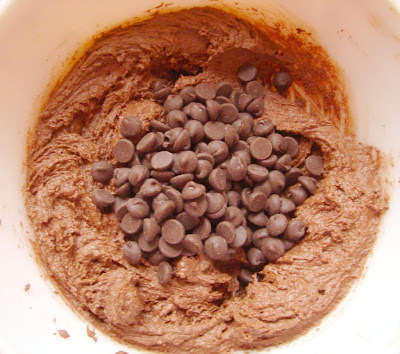 Place the flour, cocoa, baking soda and salt into a large bowl and mix well. - In another bowl, cream the butter and two sugars together until light and fluffy. Add the melted chocolate and stir well. Beat in the vanilla extract and crack in the egg, then mix in the dry ingredients. Finally stir in the chocolate chips. - Scoop out 12 equal portions of the mixture - an ice cream scoop and a palette knife are the best tools for the job - and place onto a lined baking sheet about 2½ inches apart. Do not flatten them. - Transfer to the oven and bake for 18 minutes, then test with a skewer - it should come out semi-clean and not wet with batter. If you pierce a chocolate chip, try again. Leave the cookies to cool on the baking sheet for 4-5 minutes, then transfer them to a cooling rack to harden as they cool. I know that 2 cups of chocolate chips sounds preposterous, but it's the chocolate chips that make these cookies chewy. They resemble Pierre Hermé's Korova Cookies, but these taste better! C h o c o l a t e h e a v e n ! I'm starting the year with a BANG. I've cooked 50% of that book but totally forgot these were in there. I remember this part of the show though. No cookies for me for a while!!!! OMG OMG! i've been meaning to make these cookies all morning but never got the chance because all those assignments from my campus. but BANG! 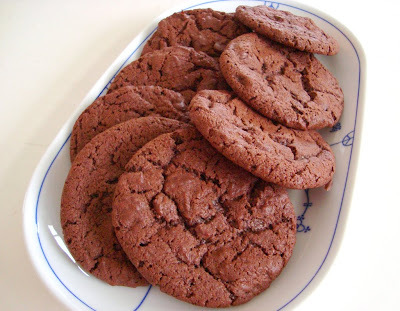 i opened your blog and there they're looking all so pretty and chocolaty. oooohh.. I'm certainly making those, they look magnificent! What a great way to start the new year. These look fantastic.